Gov. Jerry Brown signs legislation that targets the reduction of greenhouse gas emissions in California in Los Angeles on Thursday, Sept. 8, 2016. LOS ANGELES -- Gov. 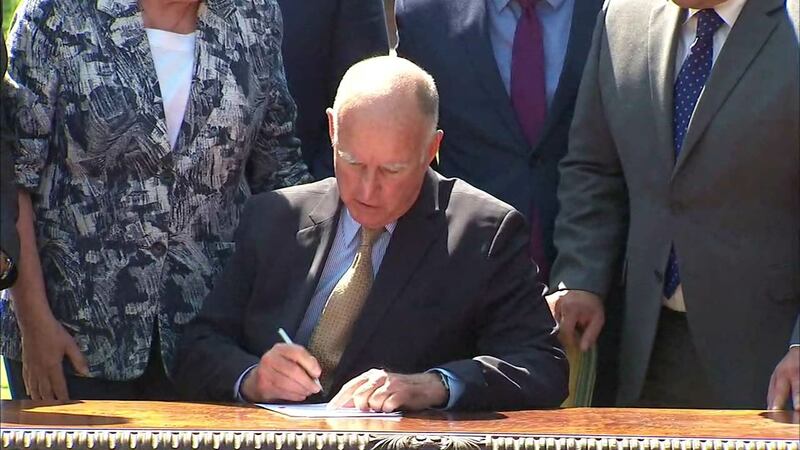 Jerry Brown extended the nation's most ambitious climate change law Thursday by another 10 years as California charts a new goal to reduce carbon pollution. "It wasn't too many years ago that our electric utilities said they could not get to 20 percent renewable electricity," Brown told a meeting hosted by the California Independent System Operator, which oversees the state's power grid. "Well, this month it's been over 26 percent. They said they couldn't get there by 2020. Now, they're all saying - all the major privately owned utilities - they can get to 50 percent by 2030."